Sunday, January 12: The gallery will open following morning worship (which begins at 10:30 a.m.) and remain open through 1:00 p.m.
Tuesday, January 14: The gallery will be open from 3 p.m. -6 p.m.
Friday, January 17: The gallery will open immediately following the presentation by artist He Qi (7:00 p.m./Doors open at 6:30 p.m.) and remain open during the following reception until 9 p.m.
A limited number of the newly published “Art of He Qi” and select posters of artwork will be available for purchase. If you have a small group that would like to visit the exhibit or would like to visit at another specific time, please contact the church at office@stpauls39.org. In commemoration of Holy Week, Art of the Passion provides a way for visitors to reflect more deeply on the passion of God revealed in Christ. This unique exhibit brings together the work of several different artists and is hosted by St. Paul’s Lutheran Church (Frankfort, IN). The Stations of the Cross was originally developed for those who made pilgrimage to the Holy Land to retrace the steps of Jesus. Particular places in the Holy Land were marked for prayer and meditation on a particular moment of Christ’s passion. This idea was eventually brought to Europe, where monastic communities created a series of images or objects as a way for those who could not travel to the Holy Land to experience walking through the story of Christ’s passion. Art of the Passion continues in this tradition by inviting a variety of artists to express their own creative interpretations of these stations and bringing those pieces together to form a meditative gallery walk that tells the story of Christ’s journey to the cross. New artwork is displayed each year and the exhibit is open to the public during the week preceding Easter. Visitors are provided the choice of a written devotional guide (provided in English and Spanish) or an audio recording of the readings and reflections. You can read more about these artists and follow the event on the Art of the Passion Facebook page! 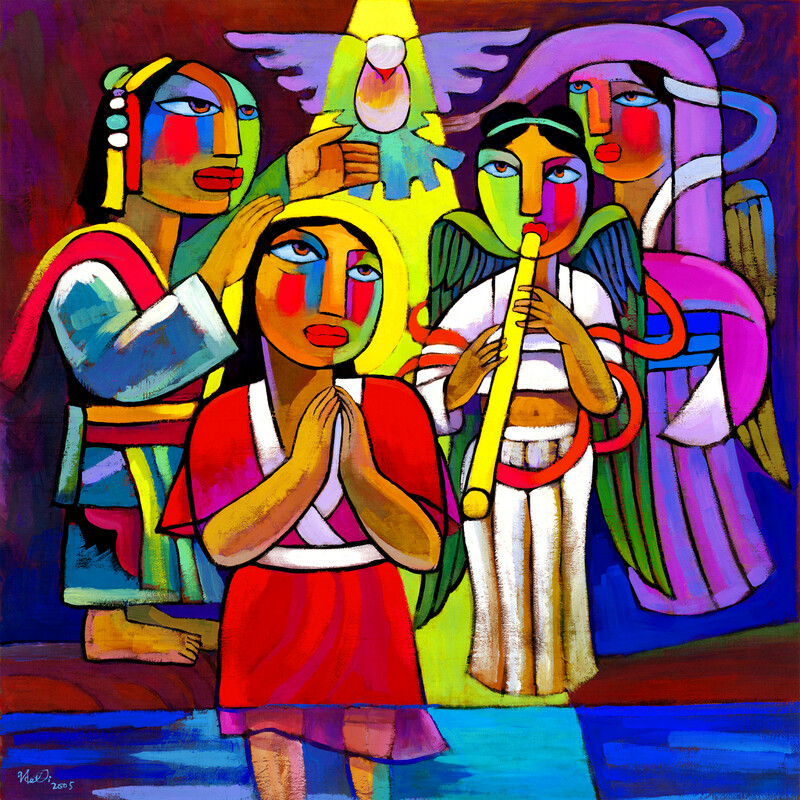 It is St. Paul’s prayer that the creative expression of these artists will allow you to enter into the experience of Holy Week in a new way and rediscover in greater depth God’s passionate love for you. Advent is a time of watching & waiting – of preparation and devotion. But more often than not, the days leading up to the Christmas holiday are quickly filled with tasks, errands, and obligations. Expectations – both those placed on us by others and those we place on ourselves – replace moments of anticipation. Written devotionals, while helpful for some, only fill our minds with more words and worries. What we desire – what we need – is a call to quietude and permission to enter Advent with imagination, creativity, and wonder. 1. Log into Facebook and look up the theme for each week in Advent on the Art of the Passion fanpage. The current post is a bit late, but future posts will be up on the preceding Saturday. 2. Watch for a word or phrase, image or experience that speaks to you about a weekly theme on Advent. If you go attend a church, you may have heard or seen something. Maybe you use a devotional or peruse the appointed Scripture. Maybe it comes from somewhere else. Don’t be overwhelmed – choose something you already do, and watch for the Advent theme. 2. Starting from that focus point (or general idea)- sketch, draw, paint, sew, photograph, weave, or otherwise visually explore the theme. Limit yourself to no more than one hour. Of course, we won’t know you if you spend more than an hour, but don’t let it be a stressful experience – it’s OK to allow it to be incomplete if the time runs out. Our hope is that by participating, you will find a space for your own creativity to be drawn into preparation and devotion; and that we all will be encouraged in our own watching & waiting. The 2013 Art of the Passion exhibit will feature all new pieces by several talented artists working across an exciting range of media. The featured artists will each depict one of the traditional Stations of the Cross, which will then be placed together with a final compilation piece as a meditative gallery walk. 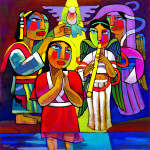 The Art of the Passion exhibit will be open to the public during Holy Week, March 24th-March 30th, 2013. Times, group reservations, and other information forthcoming. You can also follow the Art of the Passion on Facebook.